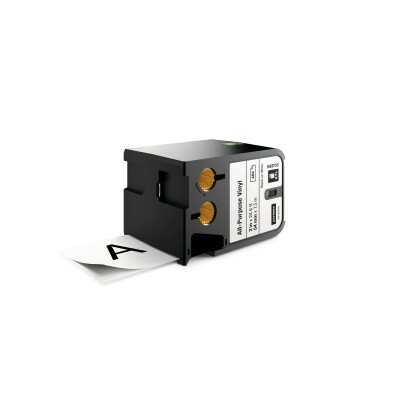 Dymo XTLâ„¢ labels are durable and made for a variety of surfaces. Whether you are labeling to OSHA, ISO and ANSI color standards or labeling in harsh conditions, Dymo XTL labels have you covered. Jobsite-tested and UL-recognized, these labels wonâ€™t smear or fade. Compatible with DYMO XTL label makers. - Easy-to-peel split back design or pre-sized labels make applying labels quick and easy. From textured surfaces to cables, vinyl labels are ideal for almost any labeling application. Vinyl offers moisture, chemical and UV resistance, making it ideal for labeling both indoors and outdoors. Available in sizes from 12 mm to 54 mm (0.5â€ to 2â€) and in a wide range of colors that fit with OSHA, ANSI and ISO color standards to enhance workplace communication and safety.